Image Processing tab includes options allowing to process printed images: scale, crop and rotate. Resampling/scaling an image is changing its size without loosing original proportions. This includes both increasing or reducing image resolution. Cropping images allows to align or remove unwanted elements from the documents. 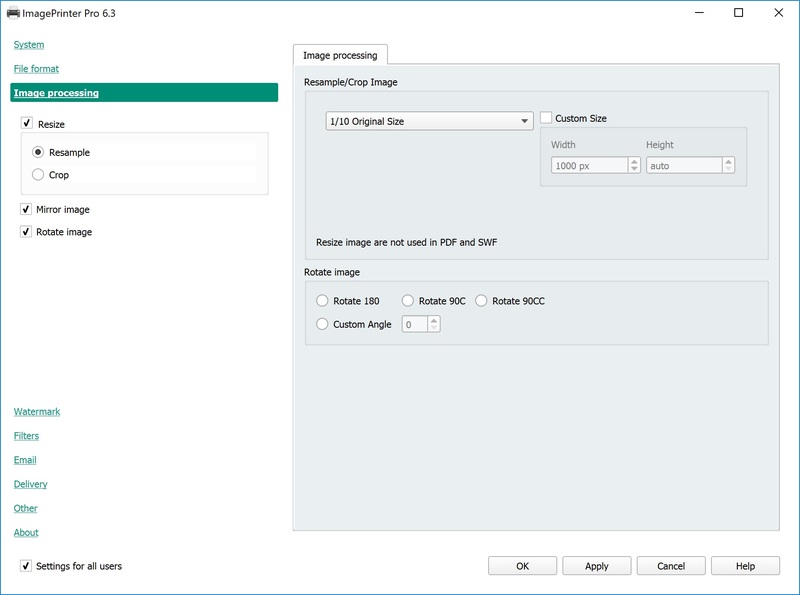 To resample or crop images, check Resize checkbox and choose according switch. Resampling allows to change size and Crop to crop images. In order to apply mirror transformation check Mirror image item. Resample Specify image size relative to original. Custom size — specify width and length of the output image in pixels (if checked).If auto value is enabled, Width and Height will be adjusted proportionally. These options have no effect for PDF and SWF formats. Check Rotate image item in order to rotate images. Rotate 180 — rotate image by 180 degrees clockwise. Rotate 90C — rotate image by 90 degrees clockwise. Rotate 90CC — rotate image by 90 degrees counter-clockwise. Custom Angle — rotate image by custom clockwise angle. Warning: These options have no effect for PDF and SWF formats.